All online bidding for this auction is on Bidsquare at www.bidsquare.com. The buyer's premium is 22% in-house and 25% on Bidsquare. Pook & Pook is proud to announce their latest auction, Furnishings and Decorative Items from the Home and Offices of Dr. Albert and Laura Barnes. This sale will be held on the evening of Friday, March 15th beginning at 6 pm, preceded by a wine reception and preview. 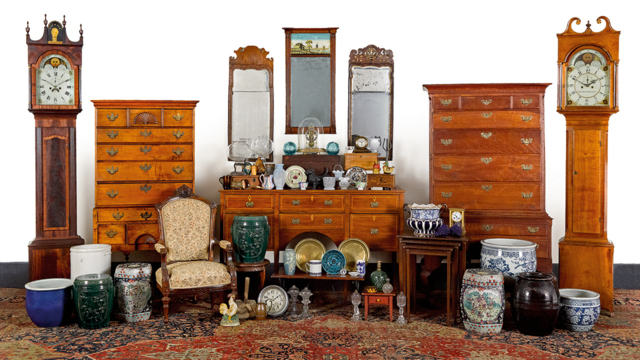 Located just forty-five minutes outside of Philadelphia, the Downingtown-based auction house is celebrated for their remarkable results on early American furniture and Pennsylvania Dutch folk art. Pook & Pook is thrilled with the opportunity to offer furnishings and decorative items from the home and offices of the venerated Main Line art collector and businessman, Dr. Albert C. Barnes and his wife Laura Leggett Barnes, which have been consigned by the Barnes Foundation. Dr. Albert and Laura Barnes selected many fine antiques from prominent early 20th century dealers, with a focus on 18th and 19th century Pennsylvania pieces, when furnishing their residence and offices. Dr. Barnes specified in his trust indenture that these household items be sold at public auction after his death. 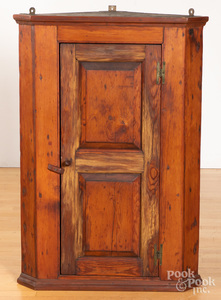 The items offered for auction consist mainly of fine tall case clocks, early American furniture, charming decorative items, textiles, and household effects from the residence of Dr. Albert and Laura Barnes and the Barnes Foundation offices, along with furniture and decorative items previously owned by former Director of Education, Violette de Mazia. The sale is modest in size, with around 150 lots set to cross the auction block on Friday evening. Bidders are welcome to bid in-house, via absentee or phone bid, or online exclusively on bidsquare.com. 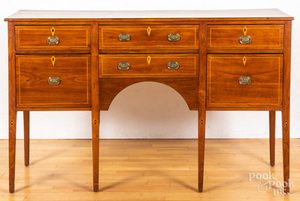 Fine pieces of furniture in the sale include a Southern Federal walnut huntboard, ca. 1805 ($2,000-$3,000), a Pennsylvania Chippendale walnut tall chest, ca. 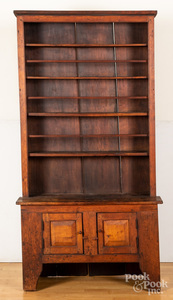 1780 ($3,000-$4,000), and a Pennsylvania pine two-part Dutch cupboard, ca. 1790 ($2,000-$3,000). Decorative items worthy of mention include a Serapi Carpet, ca. 1900 ($2,000-$4,000), a York, Pennsylvania Chippendale walnut tall case clock, late 18th c., with an engraved brass face inscribed by Rudolph Spangler ($2,000-$4,000), and a lovely Tiffany Studios bronze graduate pattern desk set ($400-$700). Filling out the sale are many fine Queen Anne looking glasses, a grouping of Chinese jardinières and garden seats, pieces of impressed stoneware, a variety of tavern tables, cupboards, bucket benches and more. A selection of lesser quality items have also been offered for sale through an affiliate auction company. Interested bidders are encouraged to contact Pook & Pook at info@pookandpook.com or (610) 269-4040 with questions regarding condition reports, online, in-house, phone or absentee bidder registration. Gallery exhibitions for March’s auction are scheduled for Wednesday, March 13th and Thursday March 14th from 10 am to 4 pm. On Friday, March 15th, preview will be held from 10 am – 6 pm, with wine and hors d'oeuvres being served from 4 pm – 6 pm (to RSVP please email info@pookandpook.com). Bidding for the sale will begin on Friday evening at 6 pm. Online bidding will be available exclusively on Bidsquare at www.bidsquare.com. Pook & Pook is located at 463 E. Lancaster Avenue, Downingtown, Pennsylvania 19335.